Imagine if ice cream grew in trees? Well, some say it does. 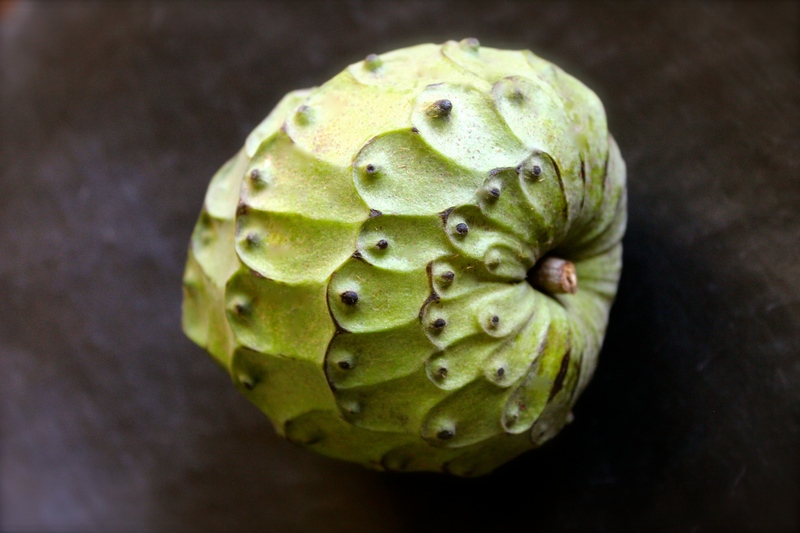 The nickname of the cherimoya is “the ice cream fruit.” Its creamy, custard-like white flesh tastes tropical with hints of banana and pineapple. Eating this one was a deliciously unique experience. The kind that I want to have more often, when you force yourself to open your mind and taste something that looks a little strange. However, I did accidentally swallow a seed and they are toxic. If you get a post tomorrow, it means I survived. But I don’t think I will give these to my kids again. The fruit is similar to a watermelon – full of seeds that you need to avoid swallowing. The skin is toxic, too. But the sweet interior is full of vitamin C and fiber, so I am really glad we tried this one! On day 52 of this 365 day project, I ate my daily five (including an entire pint of gigantic blueberries). Did you enjoy yours?